High Quality Content by WIKIPEDIA articles! 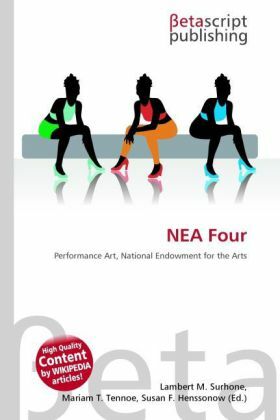 The "NEA Four", Karen Finley, Tim Miller, John Fleck, and Holly Hughes, were performance artists whose proposed grants from the United States government's National Endowment for the Arts (NEA) were vetoed by John Frohnmayer in June 1990. Grants were overtly vetoed on the basis of subject matter after the artists had successfully passed through a peer review process. The artists won their case in court in 1993 and were awarded amounts equal to the grant money in question, though the case would make its way to the United States Supreme Court in National Endowment for the Arts v. Finley. In response, the NEA, under pressure from Congress, stopped funding individual artists.